Shaun Allan Ferreira is a Chef whose career started in South Africa and after more than 10 years within the industry his road led him here, to Romania. During all these years he started from the bottom and worked his way up to the position of Executive Chef and Owner, by demonstrating the right skills and attitude. Through his journey he gained experience in cruise lines, country clubs, restaurants of multiple specialties and service styles. Being a culinary school graduate himself, he considered it a good challenge when he was invited to teach at TASTE. Here are a few words from him. Thank you for meeting with us. Firstly, I want to ask you where does your passion for cooking come from and what drives that? I grew up in a kitchen. In South Africa we cook a lot… I’ve been in kitchens like twenty years now. I enjoy the prep, I enjoy the diversity of the industry, it’s changing a lot; you never stop learning, it’s always new techniques coming up and what I learned twenty years ago is basically just the foundation. It’s like any other job. What drives that passion at the moment? I am in a different country, different environment. For me it’s good because I have my own thing and basically, it’s feasible, it’s easy for me to do that kind of cooking and teaching. It becomes your bread and butter. Yes, exactly. It puts the food on the table. It also gives me a lot of flexibility having my own thing. I don’t have to always be here. When did you first realize you want to work within this industry? In 1998. I first did engineering, worked in a boiler maker shop, cut steel and drafting and all that stuff. It wasn’t really my thing and then we knew people that had a restaurant and they said to come for the season and I was pushed in the pastry and liked it, enjoyed it. They offered me a job after my season there, I took it, I worked there for a couple of years and then I went to a culinary school. Is there any specific dish, which you can recall from your childhood, which has influenced you? We used to go fishing a lot and my grandfather used to collect some fruits, like a pear but wrinkled; you get them where the tight breaks, with a hook. You cut it, my granny used to cook it with spinach and tomatoes. All that going fishing, catching the oysters and the mussels and cooking them on the beach, I think that is a first food memory for me. Who was your mentor in your life? What was the first dish that you learned to make? Profiteroles, éclairs, French wedding cake, crock en bouche. What is the most difficult situation that one overcomes in our industry? Lack of communication, in my opinion. Probably depends on where you work, but I think the information doesn’t get passed down and then you have to fish, you have to look for answers. Pressure you learn to deal with, it’s all about being organized. If you are not organized, you put yourself under pressure; and that I learned very, very early. If you get yourself organized and you plan, you have stuff done, you think three-four steps ahead, the pressure is less. But, it depends on the individual. I’ve seen Chefs that can’t handle pressure. When the pressure hits, they explode, their environment becomes unnecessarily, they stop trying stuff; it just becomes unpleasant. The situation also depicts how it happens… Know shortcuts, but don’t apply them to everything, just know them. I think for me it’s coming up with dishes, creating things, thinking of stuff that you want to put on a plate. For me now, what’s exciting is I do weekly specials for the restaurant I work in, which is also good for the restaurant. When you have a good repeat clientele, they have obviously eaten through the menu two or three times and when they come, they see we have the special on weekend. So, for me, that’s interesting, that’s fun. Also, teaching the guys that come in, generally cooks. I try and do everything in house: I make my own bread as much as I can. For them, they don’t understand that concept… “Why don’t you just buy them?” I could buy them, but it’s cost effective first of all, you have consistency and you get to control what the product is. Especially the flavors for a returning client. I think at this stage, you probably developed a client base that is slightly more returning and actually pick up that educated palettes, which means they are looking for something that is not out of the bottle. I enjoy being able to make things from scratch. I like that I have that knowledge and I can pass it on to whomever… It takes them a while to get them, the mind-set, because they don’t get why I am doing this. But in the end, it pays off, also from a food cost point of view. If you were to choose all over again, would you become a Chef again? I would, I’ve asked this question to myself a few times and I thought if I had to do it, I would push myself into fine dining or Michelin star restaurants. I want to see what sort of pressure these guys are under to get that sort of prestige. I would do it again, maybe just change a few things this time. In the beginning, I would go and work for prestigious places; that’s where you build a solid foundation. 20 years ago, there wasn’t too much in South Africa neither going overseas, working abroad – I couldn’t get that opportunity at the time. I would have liked that, worked abroad earlier, expose myself to different cuisines. Unfortunately, I had that later in my career, just the timing was different. Do you see a strong differentiation between learning on the job and learning in a place of learning? Is there a preferential; is there a better? What is your opinion about how you learn? Having a foundation in culinary school is good and then starting at the bottom and working your way up. I think a lot of people in the industry, owners in particular, don’t really understand. Let’s take the costing behind the plate cost vs. true costing and how to make money. When I came, the guy said: just add 300% or whatever… You can’t just add 300%, you need to break it down, get a plate cost, have a wastage percentage, all these things you have to take into consideration and you can’t just add 300%. Your plate costs you 10 RON to make, in order to have 32% cost, you have to divide by 35%, get a selling price… it’s tricky. A lot of people overprice themselves or underpriced themselves, they don’t control the kitchen like they should, you know… food cost is a big thing for me. At school. You have a whole module on food costing, accounting, restaurant management. You learn the basics, but when you physically apply them on the business, it’s a bit different. You have all these computers, they work everything out, the recipes, the unit of measures, but you need the foundation to understand where you are going. At one golf club I was working, the food cost target was 40% and that was ok for them; they weren’t worried about it, because they made their money on green fees and the drinks, so the food was sort of subsidized and they use to make 5-6% profit a year on that 40% food cost, but you are talking revenues of 10 million, so it’s good money. If you take a terrine: half of the terrine is cost, another cost is the utilities, labor, another is wastage and the 2 slices at the end is what you put in your pocket, minus the taxes… It is a very unforgiving business: You are on your feet day in day out; you are working when other people are relaxing, and it’s a lifestyle that you have to accept. Why do you think so many people believe being a Chef is an easy life? Because of the TV I think, of how television has presented the new style of Chefs now. It’s not an easy life… Everybody thinks you become a Chef, do a few dishes on TV and make a lot of money, but there is a lot of back side they are not seeing; it’s misleading. It’s easy for you to go and put 50-100 thousand euros into a restaurant, you want to get a return on that investment. Honestly, six out of ten restaurants close because they think it’s all about putting up a kitchen, making some food, making some money… it’s not like that… that’s why so many places close. Basically the school leavers is the primarily market. What would you expect us to be able to do? Probably just a lot of support in the beginning: from an administrative point of view, especially if you get someone who doesn’t speak Romanian. Students that are coming need to be able to converse in English, so language barrier and commitment from students. I’ve seen some at the practical session: 20% were keen and 20% were just “my nails, I don’t want to touch this”. Getting the correct students in, the ones that want to do the program, administrative support and the rest will figure itself out. Obviously, the modules will have to be in place, the curriculum. We are working on trying to change that. You know that Taste Culinary Business Academy was launched a few days ago. What do you know about this culinary school and what are your expectations of this school? From my experience, the facilities are great; there are few twitches that will need to happen. I can’t really say, because I don’t know what sort of students are going to come in. I think Romania needs a project like TASTE. In Romania, there are all these Chefs schools, but they just teach you how to make a pretty plate; that doesn’t mean anything to me – how to decorate a cake. You need the raw school. People need to learn the basics, the fundamentals. I think this is good. In addition to cooking skills, what do you believe other characteristics of a business person would be? We’ve spoken about HR, marketing. In other words, what other skills, besides cooking, must a business person have? Administrative, people skills, thinking on their feet, crisis management, operational knowledge and theory. 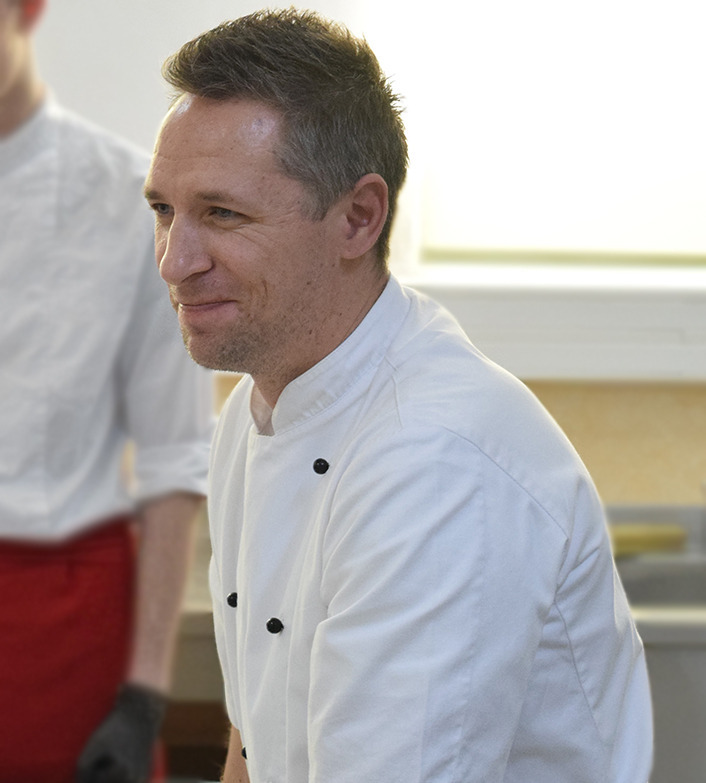 What is the one thing all aspiring Executive Chefs should know? They should know it involves a lot of work, a lot of commitment, dealing with people, problem solving etc. You have to make sure that this is what you want to do. It’s hard. Sometimes I am thinking “Why do people want to do this?” Honestly. I am not putting the industry down, it’s just that why would you want to slave over the pots and the stove? A lot of times, people don’t care, as long as the food tastes good. A lot of people who go to restaurants think that the ones working in the kitchen are lower level people, it’s sometimes very demoralizing. But I think times are changing, people are respecting Chefs more, you are not just a cook, it’s an occupation like a doctor or a lawyer. There is recognition for the craft. We are in a cycle of recognition of the craft, so that’s why the TV shows are so popular and that’s why the cooking books are so popular, there is recognition that there is a craft here. 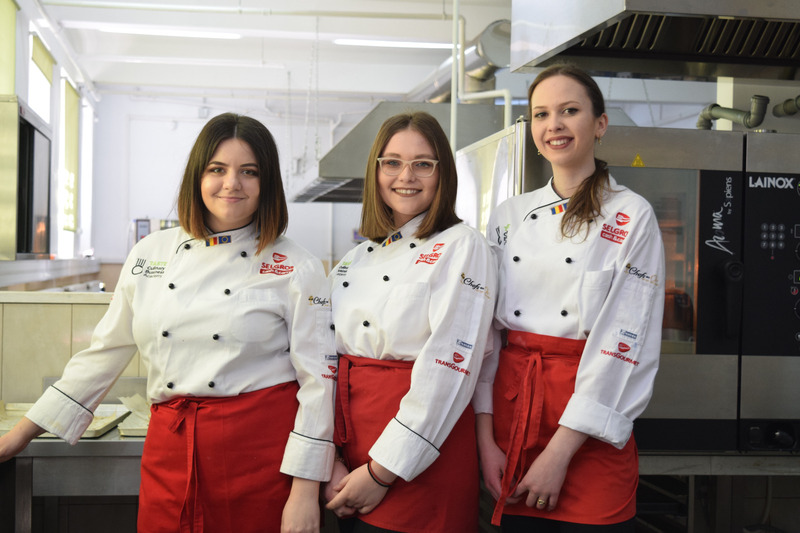 I think in Romania, from what I’ve seen in the past three years, there has been a big lead towards culinary people eating, trying different things, just the whole industry. Maybe I was a little blind when I came, but now I see people that worked overseas and are coming back; they have a lot of influential people that are pushing the industry. I think a lot of the old Romanian people are stuck on the traditional “ciorbas”, but there is place for that. I just think with the world becoming an open oyster and that everybody is moving around, you need to be able to be flexible. But it’s good. That was all, thank you, Shaun!